Sally Crum’s People of the Red Earth – American Indians of Colorado, originally published in 1996, provides an engaging cultural tour of Ice Age mammoth hunters, archaic hunter-gatherers, and 12th century part-time farmers. The history, adaptability, and tenacity of more recent tribes are explored, including that of the Ute, Shoshone, Comanche, Arapaho, and Cheyenne. A new section in the book offers summaries of significant archaeological discoveries made since the original publication. 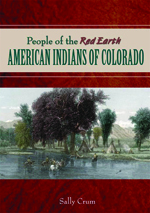 Also included in this section is updated news about Colorado’s Native peoples, ancestral and present. Combining information from archaeological research and historical and ethnographic literature, the book is enhanced by the author’s archaeological experience in the area. Lively, accessible, authoritative, and exceptionally well written for the non-specialist general reader...a comprehensive guide to recommended archaeological sites, museums, and cultural centers...a splendid work of exemplary scholarship.